Today has been one of those days where I just wanted to relax and do nothing! That’s about how this whole weekend has been! I work SO many hours at my Monday-Friday job that I’m sooo tired when the weekend gets here! 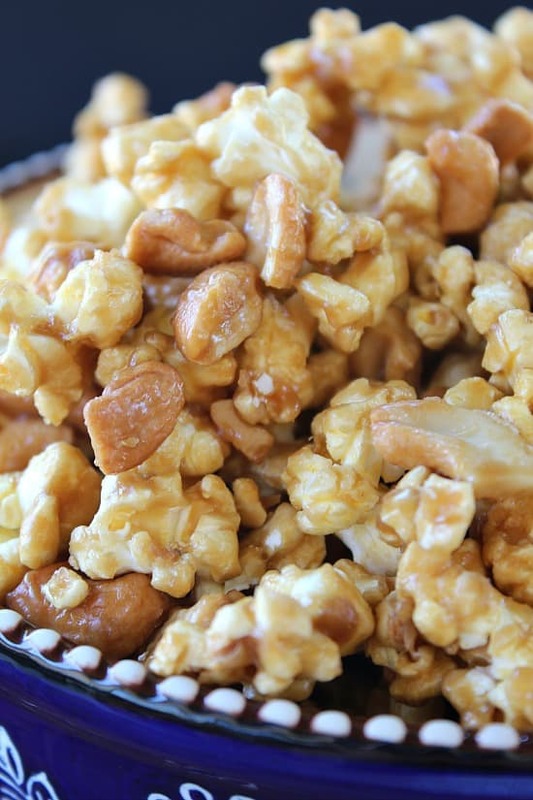 So today I was thinking of something simple, quick and tasty, and this cashew caramel corn is what I came up with and am so glad I did. This is super easy and so delicious! I used a 3.5 oz bag of buttered microwave popcorn, added some cashews, then made the delicious caramel sauce. Mixed everything together, cooked it in the oven for about 20 minutes, let it cool, then enjoyed! Pecans would be delicious to use in this too! 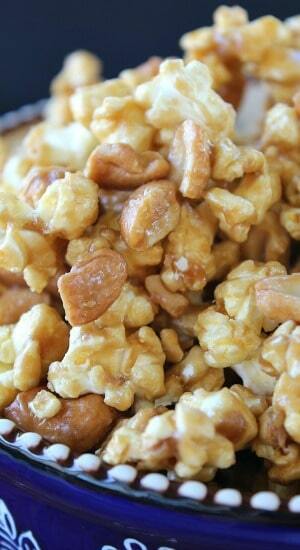 There are lots of goodies you can add to make this cashew caramel corn even more delicious! The sweet and salty flavor makes this such an addicting snack! So hard to resist! There’s nothing better than a sweet snack to munch on while watching your favorite sports team! I love Sundays! Such a great day for sports and such a great time for snacks! 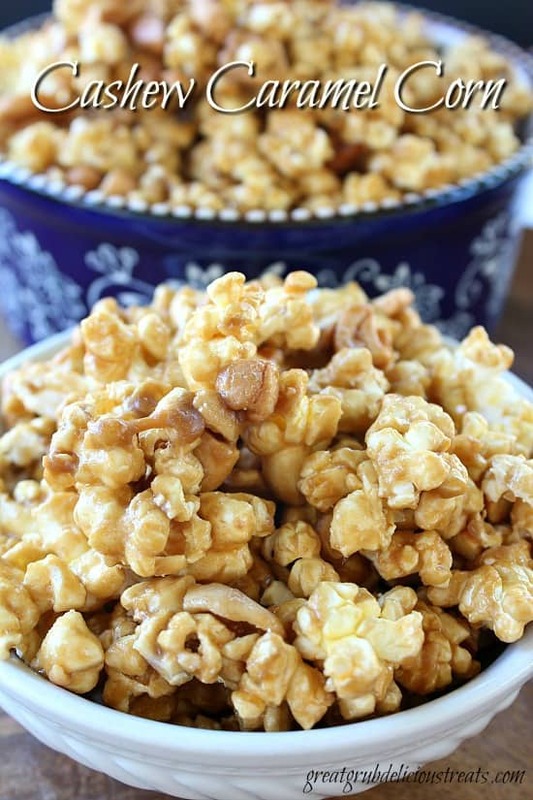 Try this cashew caramel corn the next time you are craving something sweet! Tasty and delicious!! YUM! Cover a large cookie sheet with foil. Butter the foil and set aside. Chop cashews to desired size, set aside. Heat microwave popcorn according to package directions while the caramel sauce is boiling. Leave in bag and set aside. In a small saucepan, combine brown sugar, butter and corn syrup. Stir constantly over medium heat until caramel sauce comes to a boil. Continue boiling for 5 minutes over medium heat. No stirring needed at this point. Turn off flame, stir in baking soda and vanilla. Add popcorn and cashews to a large mixing bowl. 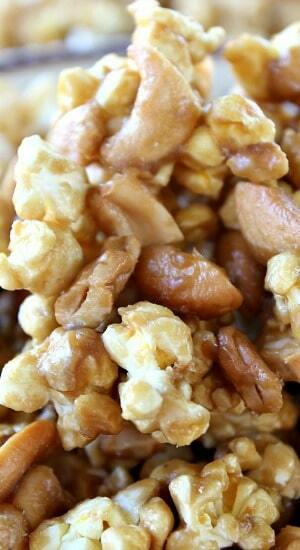 Pour caramel sauce over popcorn and cashews. Gently stir until well coated. Spread onto a second large cookie sheet and bake for 15 minutes. Take out of the oven, stir, then return to oven. Continue cooking for an additional 5 minutes. 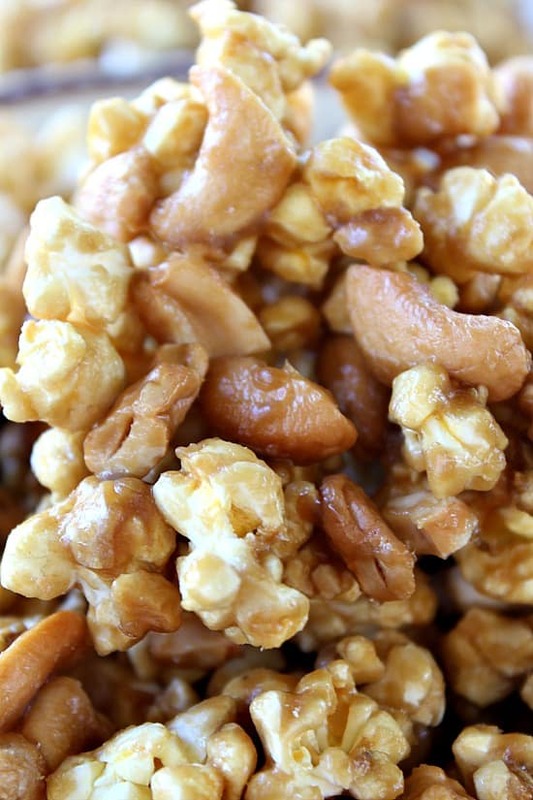 Remove from oven and pour cashew caramel corn onto prepared buttered, foil lined, cookie sheet, spread evenly. Adapted from Better Homes and Gardens New Cookbook, pg 179.